Seriously, how did this person not get a ticket? That’s just totally unsafe. The weight alone on the van had to make that classic Ford Econoline virtually undrivable at highway speeds. It was basically scrap metal strapped all over this rig. The interior was also loaded with trash. Looked like it had Mexico plates. What, they don’t have scrap metal in Mexico? You have to know this was probably loaded down with meth or something else that probably shouldn’t be in the state. 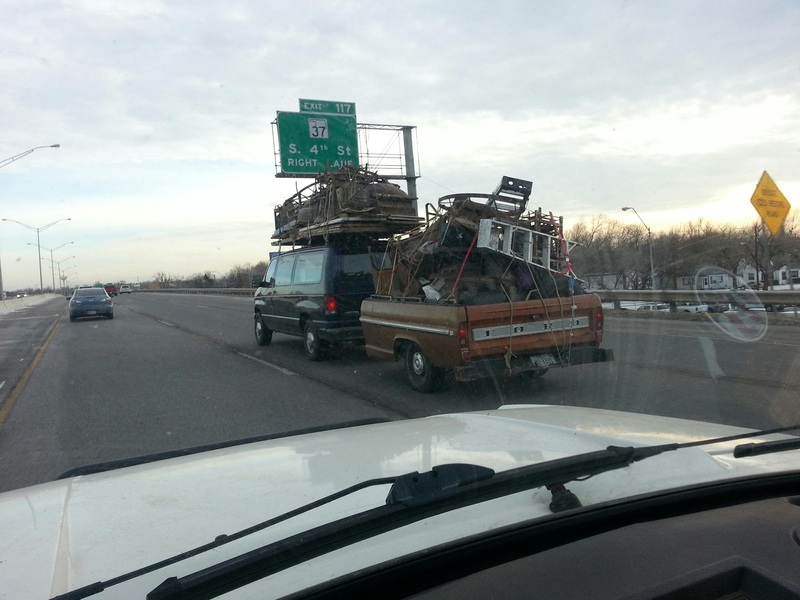 Would you as a state trooper ask them to unload it to inspect the load? Not a chance. I had to snap a pic and make a comment. We haven’t had vehicle inspections in Oklahoma since 2002. Nearly everyday I see a vehicle on our roadways that is completely unsafe. Add that to the problem of Oklahoma drivers failing to purchase AND maintain car insurance, you’d think they’d do a better job of policing the streets. As my dad would say, “If I loaded down my van like that, I’d get a ticket for sure.” It’s a fact. I would however like to have their Ford pickup bed trailer. The Evil German Dude remarked some years ago about how you would be taken straight to jail if you sawed a pick-up in half and tried to use the back half as a trailer in Germany. Don’t be that guy. Thanks for reading and Happy Rovering. This entry was posted in Evil German Dude, stupid is as stupid does. Bookmark the permalink.